We are Erin and Chris. Erin is from Los Angeles and Chris is from Boston. We met in LA, got married and continued working and living in Boston. We have no children. Chris is the brains behind the blog structure and I populate it with text and pictures; however, he has veto power over what he considers "unflattering or misleading details." We sailed around the world. How did that happen? I blame (read thank) Chris for that. Before all this adventure occurred I would have been better described as a woman who only thought of the ocean in terms of its beach and therefore its ability to provide a pleasant platform for acquiring a tan. Chris was a handy guy who liked to tinker and build things with the whopping sailing experience of summer sailing camp as a youth. That was then - until we took sailing lessons as adults, charted boats in New England waters and enjoyed time on the ocean. Then we had to make the plunge to buy a boat (our first one). 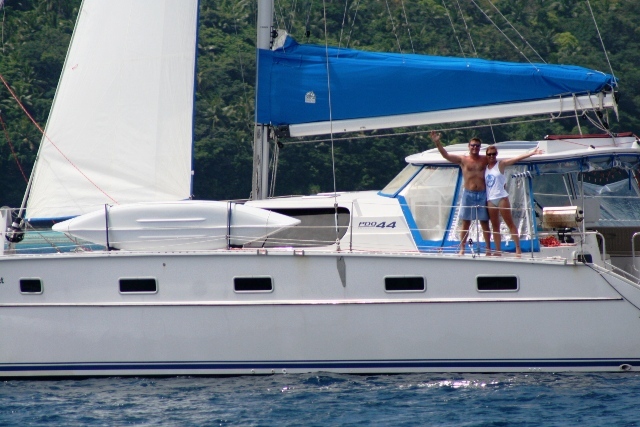 We bought a catamaran sailboat. We had a brand new boat half the size of a tennis court. We were overwhelmed - okay, maybe me more than Chris. There was a lot of trial and error as we learned about our physical plant that resembled a floating, self contained city-for-two. We had a watermaker that turned salt water into fresh water, solar panels combined with a generator to form an electrical plant that powered refrigeration, lighting and electrical gadgets and, finally, a sewage system to sort it all out on the way out the door. I slowly parsed out the elements of a balanced meal for morning, noon and night while feeling less worried about the unknown and whether or not I could find Ragu spaghetti sauce in the camel studded deserts of Sudan. Chris sorted out voltage draws, metal compatibility and epoxy science. We became comfortable in our new life and together Chris and I developed a rhythm of normalcy that included things that would have seemed anything BUT normal just a few months before. Chris became a mechanic, an electrician, a plumber (and MacGyver). I became a cook, an immigration specialist and a morse code certified HAM radio operator. We circumnavigated the globe from 2006 - 2011 and we loved it! We returned to Boston after the circumnavigation, sold the boat and re-connected with life on land - we "swallowed the hook" as sailors say. It was a nice three years and we re-established ties with friends and family. Our wanderlust kept us traveling periodically but road trips criss-crossing the USA or a month in a European apartment could not compare to living with our home on our back floating on the water. So we looked for a motor boat trawler. That is where the second section of this blog picks up. Enjoy our fun and our mis-steps and our recipes. Oh, and feel free to drop us a line, too (erin@ or chris@NotAllThose...Lost.com).